Welcome to my review of EZ Flash's newest bad boy the EZ Flash IV. This small product which is roughly the size of an original GBA cart is their answer to rival's similar products. It features the ability to launch unsigned code on your Nintendo DS thus allowing you to enjoy homebrew in all its glory. Homebrew of course are programs designed by normal people like you and is for the most part free. There is a plethora of homebrew from games to multimedia applications and using the EZ Flash IV you should be able to use them all. The EZ Flash IV comes packaged in a high quality box which is held together by some magnets for easily opening and closing it. It also comes bundled with a USB SD Card Reader and a USB extension Cable. 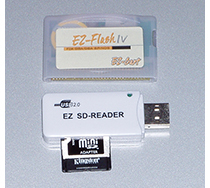 Due to the fact the EZ Flash IV depends on using Mini SD cards as its storage medium the EZ Flash team was kind enough to include a way to read full size SD cards with their product. As most Mini SD Cards come with their own full size converter this shouldn't be much of a problem when it comes to reading and writing to the card. The EZ Flash IV cartridge itself is made from a sturdy grade semi transparent plastic and as I've mentioned before is roughly the same size as an original GBA cart. This means the unit won't be sticking out of the front of your console what-so-ever. Additionally, it features a small slot for the SD Card on the right hand side of it. It however does not have a spring loading mechanism for inserting and removing the Mini SD card, but this could be a good thing if there was a spring and it were to ever break. One thing I was surprised with is the fact that device comes with no type of compact disc or any type of information on how to use it ' documentation, reference material or even a website link. So after doing a quick search on my own news page I found a link back to EZ Flash's website. After reading through their forums I found that the EZ Flash IV depends on two pieces of software to make it work ' the Kernel and EZ Client. The EZ Flash IV already comes pre-flashed with its Kernel software, but I wanted it to be the latest version so I downloaded that along with the EZ Client. The Kernel is basically the EZ Flash IV's Operating System which controls the cartridge. 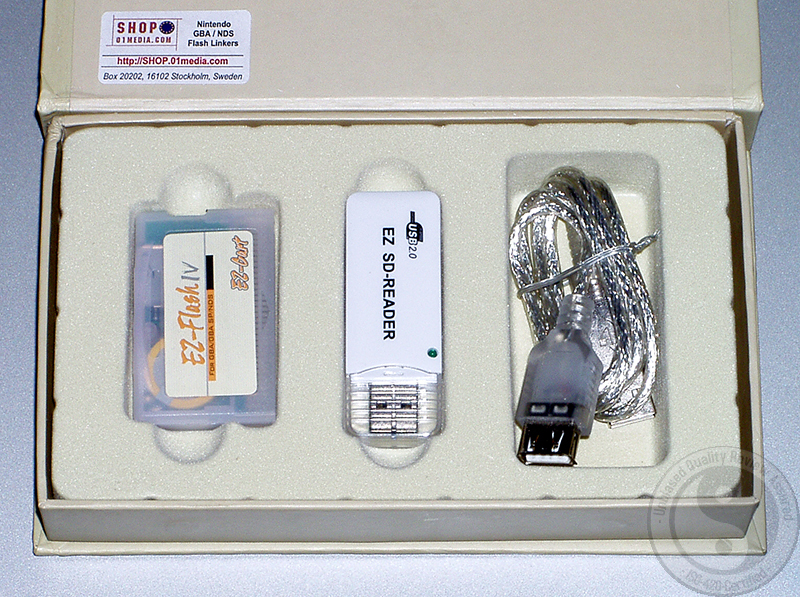 The Client software is used to convert and patch rom images so they will work with the EZ Flash IV. Before I did anything I wanted to make sure the EZ Flash IV booted up and worked fine so I inserted it into my Nintendo DS along with a Mini SD card which already contained some files. Due to the fact my Nintendo DS is flashed with the FlashMe BIOS all I had to do is turn the console on and the EZ Flash IV booted into its Kernel menu. What I noticed is that the background read 'EZ Flash III' and that it displayed the files on the Mini SD card in long filename format. It apparently had an older version of the Kernel on it so I needed to update to the latest version. I extracted the latest version (filename 'ezfla_up.bin') to the root (main directory/folder) of the Mini SD card and then following the instructions on the webpage started up the Nintendo DS while holding the RIGHT Trigger button. I got a small text display saying it had erased the old Kernel and was now flashing the new one. After around a minute it said it had successfully flashed and to reboot the Nintendo DS. Now it loaded up into an entirely new menu which a slick grayish theme. 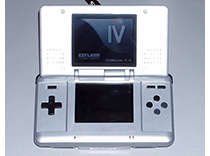 The top screen on the Nintendo DS showed the EZ Flash IV logo along with a slogan and the bottom screen displayed the menu. What was nice about the menu is that you can control it with the stylus or the buttons on the Nintendo DS. From the main menu there are a few icons ' ROM, Movie, Music and Settings. ROM displays a directory listing of the files on the card, Movie will display any GBA image you have stored in NOR memory (more on that later), Music displays nothing and options will let you change what language (Chinese or English) the menu is displayed in. I did however get an error saying it could not initialize the file system. So I took the Mini SD card out and formatted it using FAT16 (just FAT under Windows XP) and then tried it again. This time it read the contents on the Mini SD card, but it displayed the filenames in 8.3 format. I'm not too sure why the original Kernel on the card read it while it was formatted with FAT32 or why it displayed the filenames using the long format, but that Kernel is now gone as I've upgraded to the latest build. Before I even ran the EZ Client I wanted to see if it would boot clean images so I tried a few GBA images along with a few Nintendo DS. It would boot the GBA just fine, but wouldn't allow you to save in the game and play another. 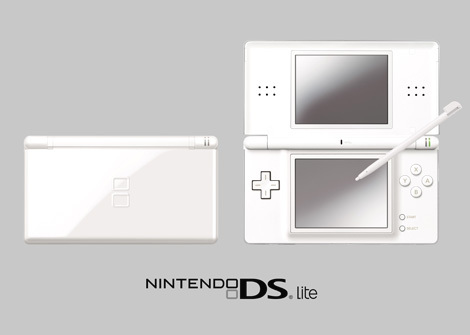 Clean Nintendo DS images only produced two white screens. So I loaded up the EZ Client to get some images converted into the correct format. When I first started the EZ Client it asked me which language I wanted so I selected English and then it displayed a simple interface. The main screen had only three options ' Open, Send and Config. So I went on to explore these options already having a good idea what each one did. The Configuration option let me choose the output path (send) where the output images would be stored. So I selected the drive letter for the Mini SD card and then continued to mess with the last two options. The last two options are to change the language and to select a new skin for the EZ Client. I selected the alternative skin and then went back to the main menu. Basically, all you need to do is pick 'Open' from the main menu and then select either one or more GBA or NDS images to convert. Once you've selected the image(s) you can click on 'Send' which will convert the file(s) into a format the EZ Flash IV can read. 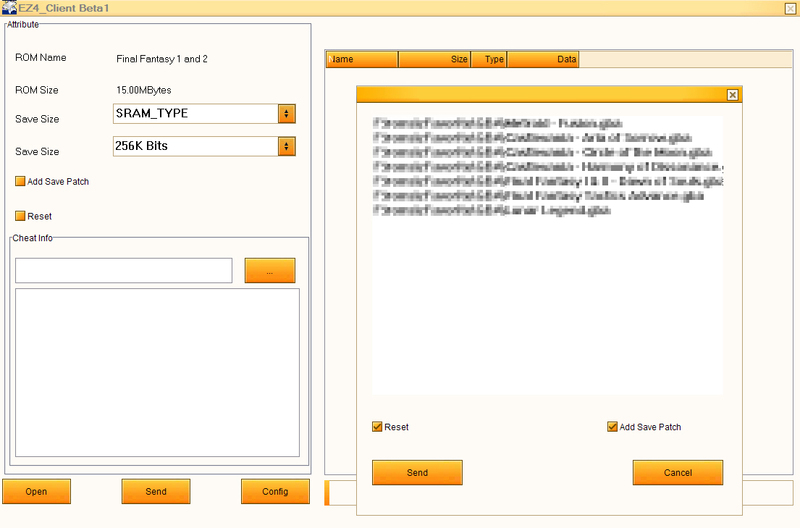 If you select just one image the EZ Client will display its internal information. If I selected a NDS image it would only display its internal name, but when I selected a single GBA image it would display its internal name, save type and save size along with letting me select a cheat file to go along with it. Additionally, I could toggle the In Game Reset and Saver Patch options. The In Game Reset will let you go back to the GBA Kernel menu while you're playing a game and I'm not too sure what the Saver Patch option does as it didn't seem to impact anything during game play. 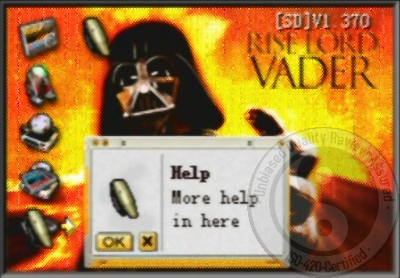 Once I had some GBA and Nintendo DS images converted I booted up the EZ Flash IV and started off with the Nintendo DS images. Once you select an image to boot it will automatically load. 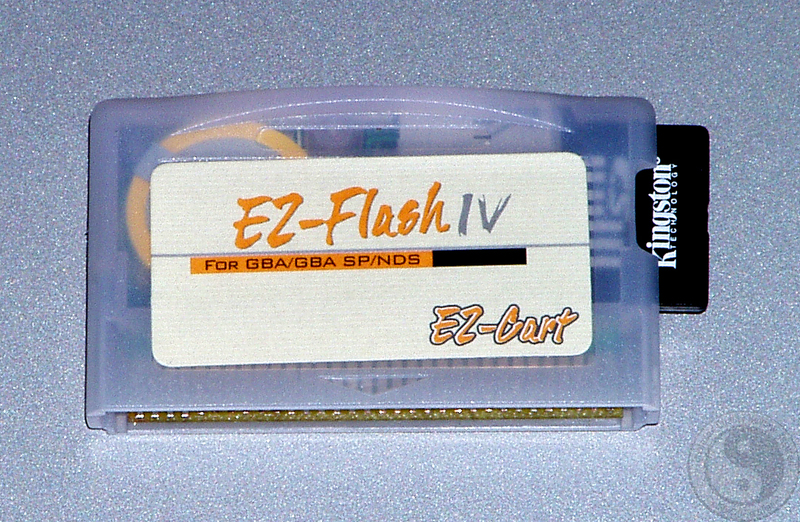 The EZ Flash IV saves your SRAM (saved games) into its internal RAM which is powered by a battery. Like other backup units once you restart your Nintendo DS it will automatically save the SRAM it has stored from its internal memory onto the Mini SD card. Next I tested the GBA images. There are two ways to go about loading them. The first way is to simply load them from the Nintendo DS Kernel. Just browse to the image in question and pick it. There is a slight delay where the Kernel freezes while it loads the image and then the Nintendo DS resets into GBA mode and you can play the game. Oh, if you want to reboot into GBA mode to select a new image and have patched your image to do so using the EZ Client you can press UP + L + A + B at the same time to do a reset. 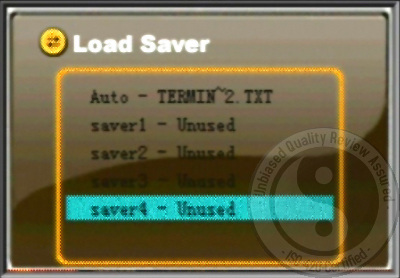 The SRAM is handled the same way as the NDS images so all you need to do is to reboot and it will save the SRAM into a .sav file on the Mini SD Card. Each .sav file is actually the size of the SRAM itself so unlike other flashcards you aren't going to be wasting space with huge save files residing on your SD card. Compatibility with GBA images is great. There is no slowdown during game play and I tested a vast array of different titles which were different sizes and had different types on internal SRAM. One thing though is if you want to run images that are larger than 128Mbits you will have to load them from the GBA Kernel. To access the Kernel on a Nintendo DS simply remove your PassMe type device or hold 'select' when booting with FlashMe. 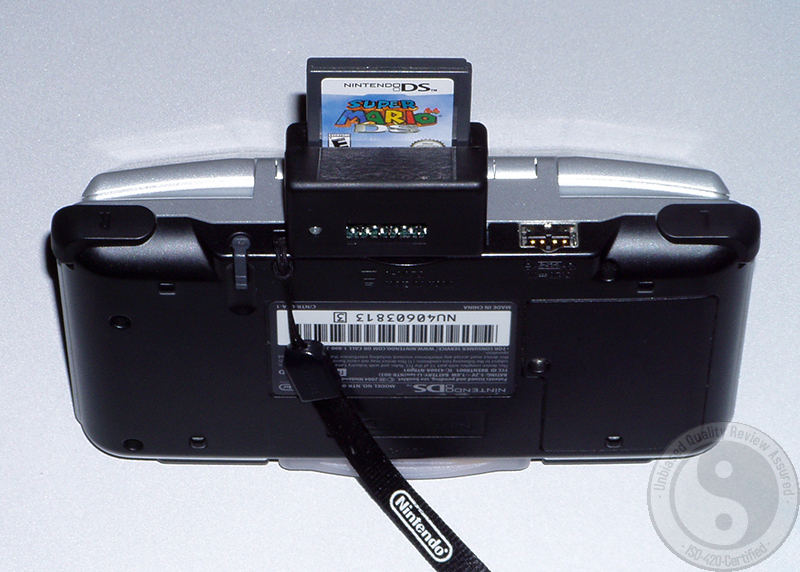 The Nintendo DS will boot into its own menu system and then you simply select to boot from the inserted GBA cart and it will load the GBA Kernel. Once you're in the GBA Kernel you can pick the image that is larger then 128Mbit and the EZ Flash IV will flash it into its internal NOR RAM. This process takes around 5-8 minutes. Once the image is flashed into the NOR RAM you can play it. Additionally, the image will stay flashed into the NOR RAM until you overwrite it with another. 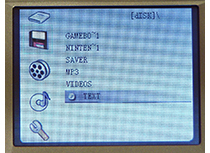 So to simply boot the image again you can select it in the GBA Kernel or from the Nintendo DS Mode you can pick the Movie Reel icon which will display what is currently in the NOR RAM and you can run it from there. Note that there are only a handful of images larger then 128Mbit, but at least the EZ Flash Team hasn't forgotten about its GBA users. 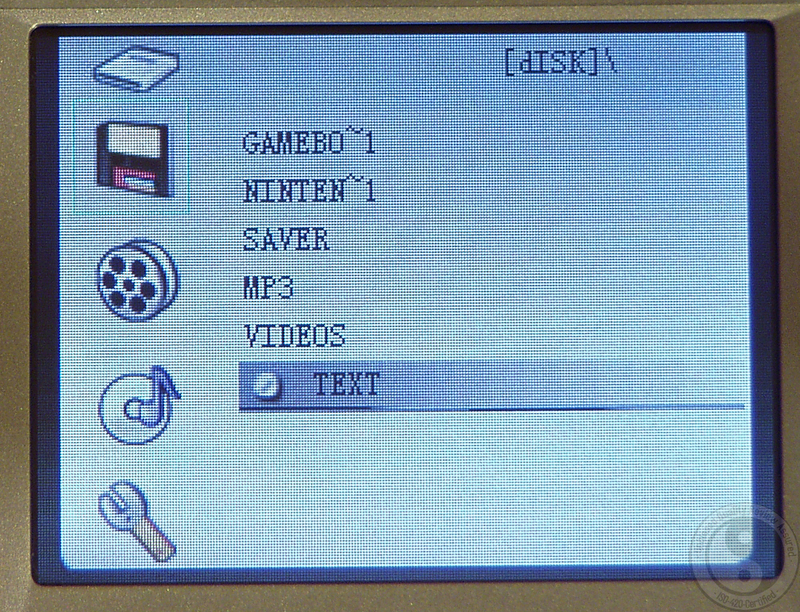 The GBA Kernel like the Nintendo DS one has its own Menu System. Once you boot into it you'll be presented with a Star Wars theme with a few icons at your disposal. You've got the Game, Text Saver, Mine's, Settings and Help icons. The Game icon will display a list of files on your Mini SD card which you can choose from. It supports GBA and text files. If you're going to be reading an eBook or what have you once you're done reading you can use the second option 'Text Saver' to save your current location in the text file so you can resume reading where you left off at. The Mine's icon is a mini-game of Mines (like the one that comes with Windows) and the settings icon will let you change your language to and from Chinese to English. The last icon will display the Help text file in both Chinese and English which gives you a few quick tips on how to use the EZ Flash IV in GBA mode. When downloading the EZ Client you will find a file named 'Moonshell.ds.gba' in the root directory of the archive. Simply copy this file over to your Mini SD card and you'll be good to go. EZ Flash has included this custom version of MoonShell that will work with their product. MoonShell is a must have when it comes to multimedia playback on your Nintendo DS as it can load a plethora of formats including text files, images, music and movies. MoonShell can natively view text files, JPEG, BMP, PNG images, MP3, NSF music files and playback its own DPG movie files. So the only pre-conversion you need to do is when you'd like to watch a movie. There is a separate package called 'DPG Tools' which can encode and decode various movie files including mpeg and AVI (DiVX, XViD, etc). On average you can convert a 60 minute AVI movie into a 100 Megabyte file. The custom version of MoonShell that comes with the EZ Flash IV play and views all of these formats perfectly with no hitches. I'm glad to see they have compiled their own version for use with their flashcard as it adds a vast array of functionality to their product. Compatibility wise the EZ Flash IV is a definite contender. It runs mostly every image file out there for the Nintendo DS excluding a few problem images. The EZ Flash Team has been kind enough to actually host and maintain a compatibility list for its users so you'll know what will work and what wont by simply visiting their page. There is also no slowdown present within Nintendo DS images. I tested a few that use streaming video and there was no jerkiness at all. One small issue with GBA images is that the EZ Flash IV doesn't include a Real Time Clock (RTC). Only a handful of images require one of these, but they won't work without one. Other then that there is no slowdown present when playing GBA images which seems to plague a certain competitors unit. As far as homebrew compatibility the unit will only correctly load '.nds.gba' files correctly. If you're trying to boot a normal .nds file you will need to attach the .nds loader found with the FlashMe install to each file before you can boot them. Hopefully, as one of their competitors did they will add a way to boot these homebrew without having to patch them first. 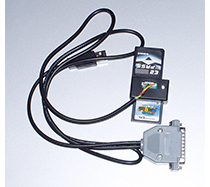 Of course, to actually get the EZ Flash IV to boot you're going to need to use one of the many 'PassMe' type solutions. 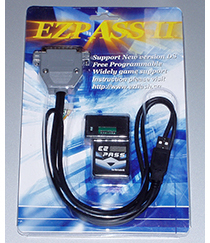 Currently, the market is flooded with such devices and EZ Flash markets their own named the 'EZPass II'. Their device hooks up to your computer using either your Parallel Port or USB and will let you program it with the .dat file that is needed to boot the image you'll be playing. Note that you only have to program the device with a .dat file if you're using a newer Nintendo DS or a Nintendo DS Lite. Programming the EZPass II each time you want to boot a different image is very annoying and not practical if you're on the go and don't have access to a computer. There is currently one other device that will let you bypass programming all together on newer Nintendo DS models which is the PassCard v2. 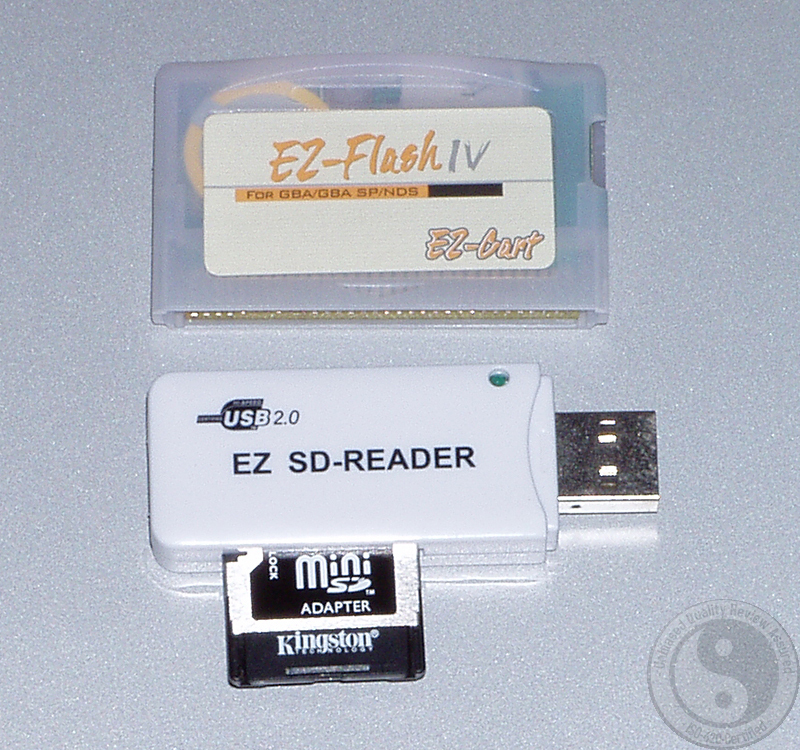 All you need to do to get the EZ Flash IV booting with the PassCard v2 is to place the file that comes with it into the root of your Mini SD card and boot your console! Sadly, at this point in time the EZ Flash IV isn't compatible with Datel's Max Media Launcher'. Although, the two devices are currently not compatible with each other the EZ Flash Team in the future could add support for the device via a new Kernel update, but currently do not have any plans to do so. 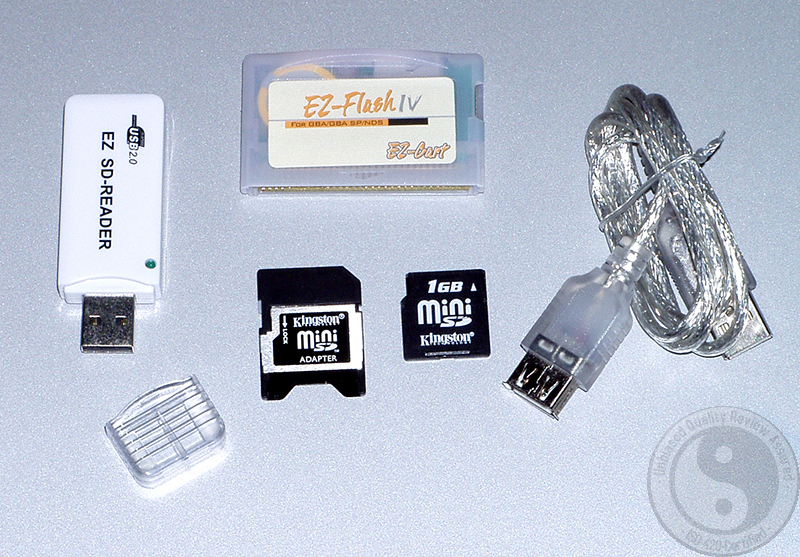 Due to the physical form factor, reasonable price, good compatibility and slick Kernel software the EZ Flash IV is definitely a contender when it comes to running your homebrew and/or backups on the Nintendo DS. Additionally, with its long battery life (7-9 hours) I'd actually say this is one of the better solutions out there and with the EZ Flash Team constantly releasing updates I would consider adding the EZ Flash IV to your list of backup units to consider purchasing.